Champion's Gravetender & Gravetender Greatwolf is a Boss enemy in Dark Souls 3. It is part of the Ashes of Ariandel DLC. No NPC summon available for this fight. As long as the fight is not triggered, player phantom can't enter the boss fight arena. Painted World of Ariandel: Cut the rope bridge that leads to the cathedral with Sister Friede and climb the bridge/ladder down to the bottom, similar to how you descend from the Catacombs of Carthus to Smouldering Lake. At one end of the frozen ground is an open area with flowers you can drop down to. Approach the ruins to trigger the boss fight. Attacks deals Standard Damage, Strike Damage, Thrust Damage and Magic Damage (2nd phase). May also cause Frostbite (2nd phase). Gravetender can use Valorheart's weapon arts. Weak to Lightning Damage and Bleed. Resistant to Frostbite and Poison/Toxic. Shield can be guard broken, what gives an opportunity to perform a critical strike. Also can be backstabbed. Champion can be easily be staggered. If the Greatwolf howls while the Gravetender is still alive, the Gravetender will get buffed, indicated by the Warcry's red aura. Appears when Gravetender's health is lowered by about 55 percent. Attacks deal Standard Damage. May cause Frostbite (2nd phase). Weak to Lightning Damage, Fire Damage and Bleed. Players can break his poise, which gives an opportunity to perform a critical strike dealing significant damage. This boss is an NPC sized character that wields Valorheart. In the first phase, he will be accompanied by a pack of small wolves. He can be taken on fairly straight up. Once the pesky wolves have been dispatched, his health bar gets depleted rather quickly. Be mindful of his weapon's guardbreaking and combo moveset, and try not to over rely on your shield. Dodge effectively, reading his patterns and attack when he presents an opening. When he reaches half health, his partner, Gravetender Greatwolf will arrive, who is a much larger wolf with a deadly moveset. The wolf is fast and has a powerful forward rush that will launch you into the air with devastating damage, using the central pillar is helpful in staying clear of its attacks. It can also breathe frost that will affect you even if you are using the central pillar for cover. The key to handle the wolf is to stay to its side, avoiding its slash attacks, and recognizing when it is charging up its dash attack, giving you time to effectively dodge to the side of it. Try to take out the Champions Gravetender first and it will make the fight with his partner much easier. To be taken in conjunction with everything else, below is a playbook of how to beat this fight with at least three Estus left, as it was field-proven by this contributor. 1. Champion Gravetender summons his big Greatwolf at half health. Play the first phase as safe as you can, being very evasive, killing the wolves first. To get the wolves easy, bait the nearest wolf, which is sleeping to Gravetender's right shoulder. Next, go around the right of the whole batch of pillars and there will likely be another wolf. It is not 100% essential to use these vectors, but they help. 2. Kill Gravetender second. Don't interrupt his combos, punish and go for openings only. 3. If Gravetender is still alive when he calls his Greatwolf, separate them, but don't bring the wolf's health down, because he will buff into a red-eyed variant. Kill Gravetender by punishing his soul-spear magic combo and when he's open or recovering, and absolutely do not stay in the line of attack with the wolf. 4. Kill the wolf. Basically, it's the Sif strategy of simple dodge rolling and hitting the legs from the sides and inside while in first stage, you can punish his frost by rolling inside the lines of spray, and hitting him. More than two hits for a punishment is dangerous. 5. 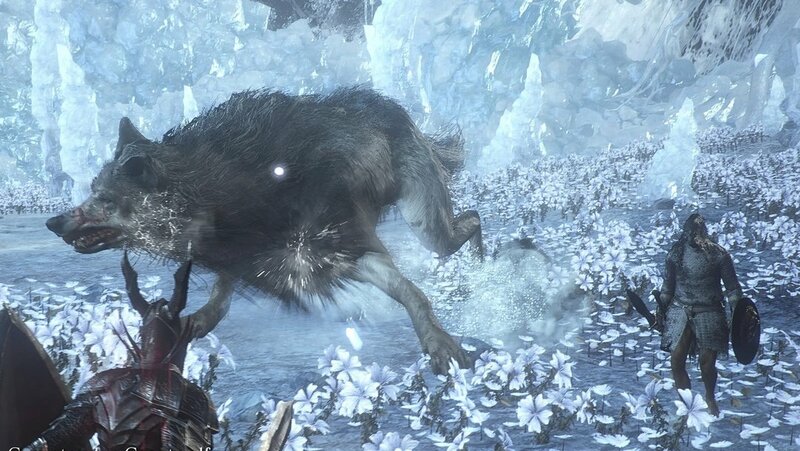 The giant wolf can do a dashing cyclone attack up to four times in rapid succession. In his first phase (before he buffs), he is likely to do it three times. 6. If you have too much heat on you, use the pillars and such to buffer yourself, and conserve your stamina. Don't panic roll or spam panic swings, or you will get hit. None of the enemies heal, so use that to your advantage to keep your punishments as short as possible. Equipment: Carthus Rouge, Carthus Curved Sword +10 (or any non-large weapon that causes bleed damage) wielded in two hands, Medium armor set. After entering the area with the fight, use Carthus Rouge on the sword and approach the high building. When Gravetender rises, go back a little, as he will walk slowly, which can be used to eliminate 3 nearby wolves (with them, the fight is much harder). When Gravetender is alone, re-use Carthus Rouge and attack him in the moments in which he can be harmed with ease, f.e. after his rush attack. When his health is lowered to about 1/2, he uses (not always thought) the "By my sword" gesture, and Greatwolf will appear on the battlefield (in the middle of the arena). Do not hesitate to eliminate wounded Gravetender and re-use Carthus Rouge. After doing so - lock on to Greawolf (let you avoid his rush attacks more easily) and stick to him. During activating second phase (red eye and "roar") you can still attack him - bleed damage will kill him easily. Spell: Chaos Bed Vestige with Pyromancy Hand +10. In addition Chaos Battle Axe. Slowly approach the place with Gravetender and 3 wolves and back up a little, then cast CBV a few times to eliminate them (they are vulnerable to fire, so even non-direct hit will cause massive damage). Gravetender alone is an easy target, but his rush can deal a lot of damage (spells can't break this attack) and he can avoid them. If Greatwolf approaches, do not look on him and eliminate wounded Gravetender. Greatwolf is vulnerable to fire - so CBV can easily deal even 600-700 damage per hit, but be careful with his attacks, as most of them can be fatal. However, HP base (especially if you won 2 encounters with him and regular wolfs) is low, so few a CBVs will kill him without any problem. Valorheart Special Attack - Sword Gravetender uses Valorheart weapon art - swift sword attack. Can be avoided with ease. Rush Attack If player is at medium distance, Gravetender starts to run, which may end with a swift and medium damage dealing attack. Can be avoided or blocked, but not broken. Block Gravetender uses his shield to block player's attack. Valorheart Special Attack - Shield If Gravetender is blocking, he can perform a roar attack with his shield. Doesn't deal much damage, but drains a lot of stamina. Critical Strike If player is stunned, Gravetender approaches and performs a critical strike. Magic attack After Greatwolf appears, Gravetender sometimes switches to a staff and casts either Homing Arrow or Snap Freeze. Rush Greatwolf rushes 1/2/3 times, dealing high psychical damage. Attack is telegraphed by white snow appearing around Greatwolf, though it can be avoided. Can be blocked. Ground Head Rush Attack Greatwolf lower his head, then swiftly rushes towards player causing massive physical damage. Head sweep Greatwolf sweeps his head 2/3 times, causing physical damage. Swift rush + Frozen breath (second phase) Greatwolf rushes through the arena 2 times, then stops and breathes in player's direction causes massive frost damage. It should be noted that the Champion's Gravetender was likely the Champion's page referenced in the description of Valorheart. He and the Gravetender Greatwolf are both referenced to have been extremely loyal to the Champion, so we can assume they are watching over the Champion's grave. Gravetender Greatwolf appears to have some history with the Farron Followers and The Abyss Watchers of Farron Keep. For more, an article about Wolf's Blood, The Abyss Watchers and Artorias can be found here. The Greatwolf which appears during the fight can be encountered twice - at the entrance to the area with a tower with Millwood Knights and near this tower. If you kill Greatwolf without winning those encounters, you lost the chance to obtain loot (Large Titanite Shard x3 for one victory). During these encounters, he uses the moveset from the boss battle and is supported by a pack of wolfs. In addition, if player wins those fights, Greatwolf's HP during the boss battle will be lowered by around 15%. This is a permanent effect. Gravetender, in order to call Greatwolf, may use the gesture "By my sword". Few of Greatwolf's abilities mirror Vordt of the Boreal Valley. Bug (Very rare): Greatwolf, instead of fighting, circles around player without attacking him. Sacred Flame works wonders on gravetender. He&apos;s completely locked if you have enough att. 3 Chaos Bed Vestiges casts was all it took for me to kill the greatwolf. Fastest method I&apos;ve tried. Dohry&apos;s Gnawing makes this boss a JOKE! 2 hits proc on the Tender, EVERY hit procs on the Wolf. Took bleed procs for each one. Just make sure your cast speed is maxed out, or you won&apos;t be able to cast on the wolf fast enough. D.S G.A, Lothric Greatshield, Toxic Mist and Bow. Defeated Wolf twice during prior encounters. Drew lil Wolves agro killing them before NPC got to me then kited him back under pillars, killed him before G.W got close, poisoned it around pillars and wailed on him. Very predictable moves, 3 or so hurricane lunges you roll/hide from, keep toggling lock-on and smack him after his 2nd short bite combo finishes. Got it on my 3rd try, if my damage output was lower I&apos;d patiently take out Human before triggering Wolf 2nd phase. Quick tip, they aren’t immune to toxic. Just used it and caught both in the cloud, does major damage to the wolf’s health. Yeesh. All these comments had me thinking this would be so much more difficult. Just kill the three wolves, smack around the gravetender, and have a high stability shield to block the big wolf&apos;s dashes unless you wanna roll around. Black knight sword +5 stunlocked the gravetender, nearly 1-shot the smaller wolves, and had the big wolf down in maybe 10 hits. If you took all the salt about this boss in the comments and spread it onto this boss area, it would be a lovely orchard. O I used the crow talons. At 50 dex /25 luck and +10 sharp talons i bled the wolf to death in 4 attacks using the WA. The WA also destroyed the champion gravetender. He tried to block with his shield and dive in with his sword. Both times he met the crow talons WA. I guess what I&apos;m trying to say is both are very weak to bleed. You can also use the dark hand twice and activate the second phase with almost full heath and all estus. Greatwolf doesn&apos;t seem to be weak to bleed in its optional fights (tested with Bleed-infused Reinforced Club+4), couldn&apos;t get it to proc no matter how much I whacked it (for comparison, Sulvayhn&apos;s Beast bleeds in 3 and Monstrosity of Sin bleeds in 2). what makes this fight easier is to poison him before the big wolf comes out. Once the posion is applied you will fight him normally until he calls for his big wolf. While he is doing the gesture do whichever does most damage to him then just follow him cause he will roll away at this point. If you parry him one more time or hit him enough eventually the poison will finish him off. Then its just the big wolf. Can someone help me with this boss, since i am not that high lvl (36), will appreciate a lot.